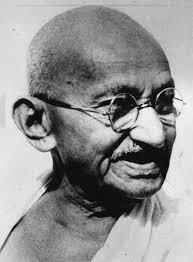 This day 66 years ago Mahatma Gandhi the man who inspired leaders around the world to non violent struggles, the apostle of peace was assassinated…. shot point blank…. by a person who was not able to tolerate something that was against his core beliefs… And even today after 66 years intolerance is the biggest curse that has engulfed our society… be it religion, individual belief systems or politics…. Beyond great people there is a message they uphold…. a message that is always bigger and relevant than the people themselves… but the sad part is often the world forgets the message and only remembers the person…. so today let us for a day, one single day forget the man in the Mahatma and remember the message that made the mahatma…. Nonviolence…. or more aptly “fearless nonviolence”…. If you go up in space and light up the areas where violence happens in this world…. Will we see a well lit earth?…. This is a hypothetical question but many might say yes…. and it does not matter if that is true… but what matters is why someone says so…. it only shows that we acknowledge that there is more violence around us more than nonviolence…. in the name of power, religion, money, politics and many other things, violence have become a part of our world so ingrained that it is not just on war fronts.. but on our streets, in our houses, in our schools, in the institutions we have built. our newspapers fall on our doorsteps with blood stains crying out through its printed words…. We live in a very violent world…. and we need to accept it if we have to change it…. The biggest question is what makes our world so violent…. what makes us trouble, torture and kill others… what makes man his own biggest enemy…. and I can only find one word as the answer ‘Intolerance’…. so now the question is what makes us intolerant…. Intolerance even if we know what it means it is important that we be reminded every moment…. intolerance is the refusal to accept and respect the beliefs and opinions of people different from us in race, beliefs, economical or educational standing and so on…. Are we intolerant is a question we need to ask ourselves everyday…. To be intolerant one should not be enslaved to a belief system… but in our world that is not practical because enslavement to belief systems have become a fashion… if you are not you have a problem… so the question is how does one avoid being intolerant while being enslaved to a belief system….. It is a tough question… but not one which cannot have an answer… But I am not here to give answers I am just here to let people think… if you are enslaved by an idea, philosophy, belief… how do you not become intolerant…. how do you acknowledge in the other person his reason of enslavement to his belief systems… how do you coexist with the person who thinks exactly the opposite of you…. So for today Jan 30th friends let us forget the man in the mahatma… and remember the message that made the mahatma….. Let us be fearlessly nonviolent…..